I have been wanting to do a wee walk around Glasgow to see its murals for a little while now. Last Saturday my sister, Valerija and I decided to spend a bit of quality time and as a result we went on a mini adventure to explore few city centre murals. This mural looms over Clutha pub which is located on 159 Bridgegate, Glasgow G1 5HZ. Back in November 2013 a tragedy happened when a police helicopter crashed into the roof of the pub/ bar. This fantastic mural on the outside wall of the Clutha bar celebrates many of the famous faces that have been associated with the venue. From Alex Harvey, Frank Zappa, and Woody Guthrie to Billy Connolly, Benny Lynch and Stan Laurel, this piece of art highlights the unique people of the city’s history. In June 2018 a giant Mural of Charles Rennie Mackintosh has been unveiled as a new addition to the existing mural marking 150 years since the architect’s birth. This wee design is not on the mural trail, so we called this one as our “new discovery”. This mural is located in the Gallowgate just opposite one of the Billy Connolly’s murals. 3 murals have been created to mark Billy Connolly’s 75th birthday who is Scottish comedian, musician, presenter and actor from Glasgow. We spotted two of them. One is printed mural which could be found in the Gallowgate near Barrowland Park, the other one is located at Dixon Street near St Enoch Square. This cosmic installation by Recoat and Ali Wyllie brings a touch of colour to New Wynd. This mural is inspired by comic book and graphic design culture which can be clearly seen in his work. You can’t miss this huge mural of Scottish badminton player Kieran Merrilees in the heart of Merchant City. This mural was created to celebrate the Glasgow 2014 Commonwealth Games. Massive and very beautiful mural can be found at the gable end wall overlooking the Ingram Street car park. 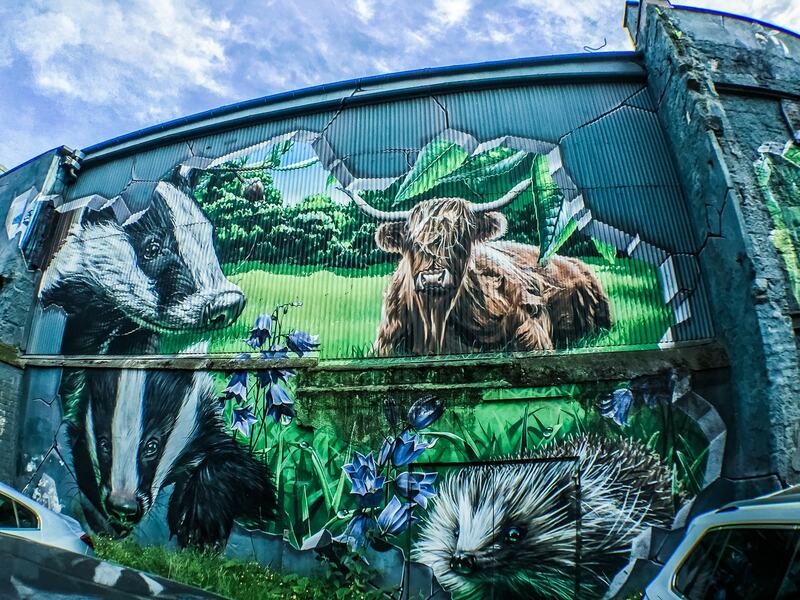 This mural captures beauty of Scottish wildlife. Covering more than 1,000 square metres and several stories, Strathclyde University’s Wonderwall is the UK’s largest mural, commissioned to celebrate the 50th anniversary of the Royal Charter which conferred the university’s status and also the 2014 Commonwealth Games. Bobby McNamara, local street artist painted this mural which was inspired by the 1980’s bands Beastie Boys and Run-D.M.C. The colourful mural, across two walls in the tunnel leading to the courtyard of Sloans, sees the Duke of Wellington’s statue asking ‘Are ye dancing’ to a feisty blue-haired busker (looking like Katy Perry) in a nod to the famous Sloans ceilidh that takes place every Friday night in the venue’s ballroom. An image from Rogue One and Art Pistol, Wind Power can be found on Mitchell Street, was originally conceived as a live installation as part of Doors Open Day 2014. The mural celebrates the diversity of sustainable energy production within the Glasgow area and throughout Scotland. An image staying on Mitchell Street of a girl with a magnifying glass – at the right angle, it looks as if she’s plucking people off the street. Mural of this fantastical floating taxi on Mitchell Street adjacent to Glasgow’s Style Mile, created by artist Rogue-one. And finally, we finished our mural trail with “Glasgow Tiger” mural that faces River Clyde. This fierce tiger is designed by Glasgow artist James Klinge. I have put a wee video together from our adventure, have a look!